It’s the afternoon of August 30th and I am calling you from the Mweka Camp at 10,000 feet at the top of the forest on Kilimanjaro. Only 10 hours ago we were standing on the rooftop of Africa at Stella Point almost 19,000 feet above sea level and looking down onto the crater rim of Kilimanjaro and out across the clouds and to the plains of Africa. Our day has been long; we woke up at 11:30 pm last night and we were climbing by 1 am. That ascent took about 5 hours through the darkness towards Stella Point. It takes a lot of determination, trust in yourself and teamwork, and it’s long. As I told this group a couple of times during the climb your watch is not your friend and your altimeter is not your friend, you just need to keep climbing! Then some hours later we were over 18,000 feet, the sun was coming up as we were approaching the top of Africa, Stella Point. 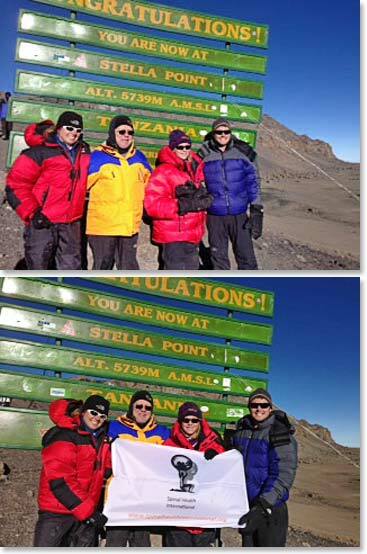 As you can see from the photographs some of us continued along the rim to the very highest point of Africa, Uhuru Peak, and reached the top of Kilimanjaro. A couple of our team members decided that Stella Point was a good high point for today. The staff was with us. We had nine Berg Adventures climbing guides and staff who actually went to Stella Point with us. It was exhausting but you can see from the photos we are happy with our accomplishments and we have got a lot of great stories to tell and more photos to send as we continue descending off the mountain. We will keep you posted about the party tomorrow as say goodbye to the staff and the rest of our adventures in Africa. The Sutterlin Family with “Spinal Health Internationals Kilmb 4 Kidz” on the rooftop of Africa, Stella Point 18,900 ft, at 7:30am. Congratulations! 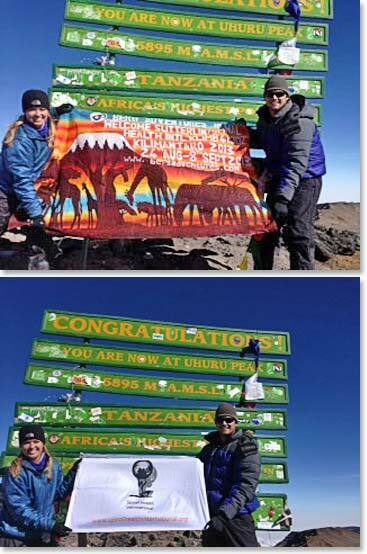 Autumn and Landon, with the Spinal Health International “Kilmb 4 Kidz” banner, summit Kilimanjaro by reaching Uhuru Peak 19,340ft. Great job team!